Albany, like the majority of the state of Georgia, can experience heavy rainfalls and high humidity year-round. The high moisture content of the soil can lead to pressure on Albany homeowners’ basement walls and foundation, causing a variety of problems. The dry season in Georgia can cause the soil beneath your foundation to sink and settle prematurely, leaving gaping holes beneath your foundation. All of these problems can dangerous, so they must be taken care of immediately. If you’ve noticed any of these problems, you may be in need of foundation repair in Albany Georgia. Contact Atlas Piers of Atlanta for more information on our foundation repair services. In need of foundation repair? Don’t stress too much – Atlas Piers of Atlanta offers a variety of foundation repair solutions designed to correct, lift, and stabilize your foundation and basement walls. All products used in our repairs are high quality ECP brand and designed to be durable and effective. helical or resistance pier installation. These piers are installed in a process called underpinning. Underpinning involves inserting steel piers beneath your pre-existing walls, deep into the soil. These piers will take the weight off of the less-compacted soil directly beneath the foundation and transfer it to more stable soils further down. 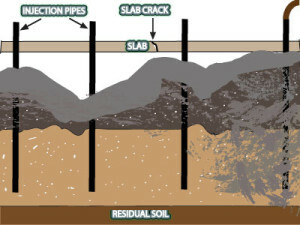 Underpinning lifts your foundation back to its original position and prevents further sinking. Piers can be installed in a variety of weather conditions. pressure grouting. Pressure grouting is used to fill voids beneath your concrete, whether it be in your garage, home, or driveway. Sinking soil causes big gaps of air to form directly beneath your concrete. This gaps provide no support for the heavy concrete, causing the concrete to crack, heave, or even fall into the void. Pressure grouting fills these voids with a high concentration injection inserted through small holes drilled into the concrete. helical tiebacks. Helical tiebacks are inserted diagonally into your basement walls. They are used to decrease the pressure caused by heavy soils outside the wall and to lift bowing or leaning walls into their original position. carbon fiber repairs. Carbon fiber strips are a cost-effective, eco-friendly method of repairs that are quickly becoming more popular. Carbon fiber strips can be applied to walls that are bowing or cracking to strengthen the wall, correct any deformities, and seal cracks. These strips are barely visible and can easily be painted over. crawlspace encapsulation. 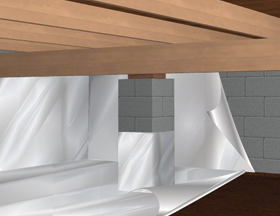 Crawlspace encapsulation is a method of basement waterproofing that is offered by Atlas Piers of Atlanta. It involves installing a waterproof vapor barrier in your crawlspace that will keep out all excess water or moisture. Whether you need an extensive project like helical pier installation or a quick fix like carbon fiber repairs, you can trust Atlas to fix any foundation problems you might have. We will give you an estimate of your repair costs so you will know ahead of the repair what the cost will be. 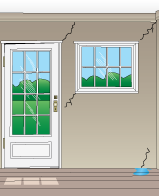 Contact Atlas today for more information on foundation repair in Albany.